I provide everything you need for a wonderful record of your day with just one package from the excitement of the morning preperations to the buzz of the evening celebrations. To this, you have the option of adding your choice of album along with a selection of other extras which are outlined below. If you’d like to discuss other options, for example if you’re having a smaller wedding and only need me to attend for a few hours, or are interested in me covering your wedding overseas, then I would be happy to develop a package personal to you. I also offer reduced rates for weddings taking place Monday through to Thursday. Photography coverage of your wedding day - £1400 - inclusive of the following items. I cover the whole of the wedding day from all the morning preperations up to the evening celebrations. Following the wedding, I present you with a minimum of 300 colour and black & white high-resolution print ready edited images which are provided on a USB memory stick for your own reprints, to print off as many times as you like. Once you’ve seen your images, they are then available on a password protected online gallery for you to share with your family and guests. I give a personalised mini card with details of the password and the gallery address to all your guests on the day. We all like something tangible, so in addition to your USB, I present you with a hard backed A4 proof portfolio containing all the images of your day. This is a great way to view your images with friends and family and for selecting your favourite shots to appear in an album if you decide to have one. Albums are available at an extra price. See below for options. Click here to view a sample album layout. I offer a complimentary pre-wedding photoshoot with all album bookings which is a great way to get used to being in front of the lens before the big day. I produce lovely guest books and signing frames using your favourite images which are always popular on the day. Please ask about costs. 80 images of your choice within a beautiful hard back coffee table book complete with dust jacket and fishtail ribbon – handmade in the UK. 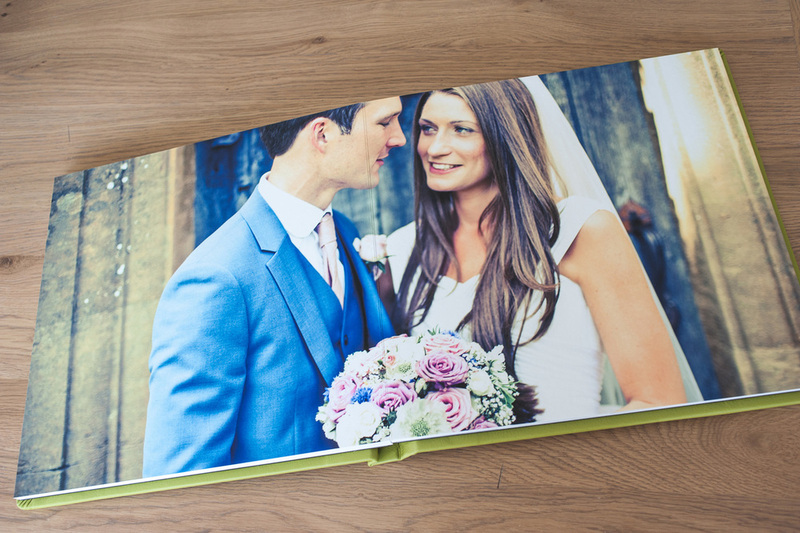 The book is panoramic format at 355mm x 255mm and the images are printed directly onto the luxurious heavy weight pages, the layout of which are all individually designed by Rachel using your choice of photographs from your day. This album comes in the black presentation box. 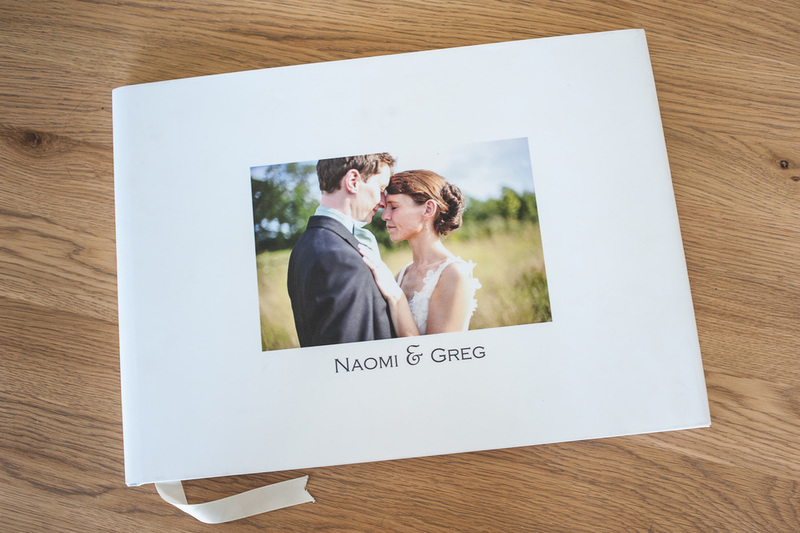 80 imagesof your choice within a contemporary Fine Art album (12” x 12”) handmade here in the UK, in a choice of leather or linen covers, including your names or date of the wedding stylishly embossed on the cover. The photographs are printed directly onto tactile fine art cotton paper pages with a lay-flat design and the layout is individually designed by Rachel. This album comes in a presentation box. 80 finished prints of your choice within a luxurious Jorgensen Square album (12” x 12”) with premium matted pages featuring protective cloth edging and metal page corners. Made entirely by hand, this album has the choice of a padded or hard backed coverin a choice of leathers and other materials (an additional supplement of £40 for premium leather options). The photographs are displayed in crisp white gallery mounts – with each page layout designed by Rachel. This album comes in a presentation box. Thank you cards, mini parents albums and frames are also available. The Small Print: Mileage for weddings more than 25 miles from Chipping Campden is charged at 40p per mile thereafter (maximum charge £90 UK mainland). If you would like to proceed with a booking, I will require a deposit of one third the total package price to secure the date exclusively for you. The balance is then payable on receipt of your photographs following the wedding. Cheques made payable to Rachel Jones or for bank transfer, please request details – see separate terms and conditions for further details.